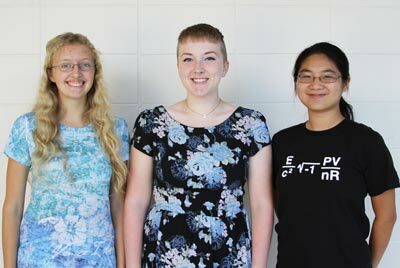 Three Hamilton High School seniors learned recently that they were named in the 2016 National Merit Scholarship Program. Eligibility for the distinction is based on results of the 2014 Preliminary SAT/National Merit Scholarship Qualifying Test. Samantha Moore, Yuchun Wang and Cassandra Zimdars were named Semifinalists. They are among approximately 16,000 Semifinalists nationwide and will continue in the competition for Merit Scholarship awards. The nationwide pool of Semifinalists, which represents less than one percent of U.S. high school seniors, includes the highest-scoring entrants in each state. To become a finalist, a Semifinalist must have an outstanding academic record throughout high school, be endorsed and recommended by the school principal and earn SAT scores that confirm the students’ earlier test performance.